As an acne sufferer, I’ve always wanted fresh, clean, hydrated, and plump skin and for the first time in over 30 years, I’ve found a line of products that help me achieve that healthy glow I’ve always wanted. After using Jordan Samuel Skin routine for over a month, my skin is like-new and I can’t stop telling everyone about it. I was recently on-set and celebrity makeup artist Keita Moore aka Kilprity asked me what I used on my skin and I couldn’t sing the praises of Jordan Samuel Skin quickly enough. 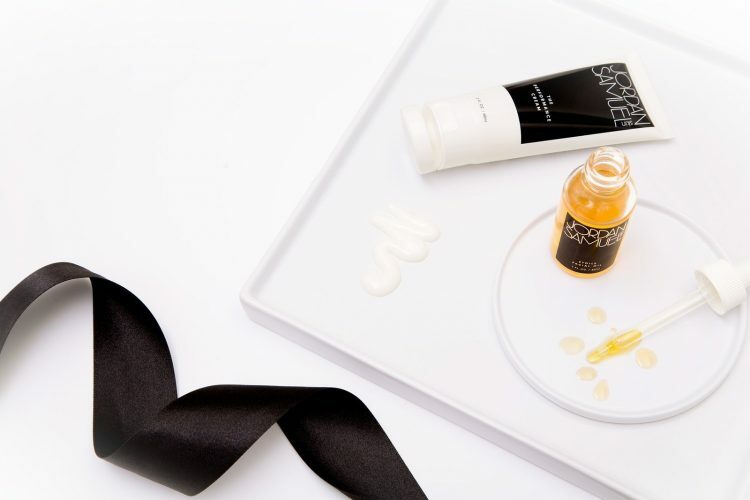 Started by classically trained ballet dancer turned aesthetician, Jordan Samuel, Jordan Samuel Skin’s line of products will help you choreograph your own skincare routine. I always expect my facial cleansers to foam up nicely and give me that fresh, clean feeling. However, Jordan Samuel Skin Matinee Gel Cleanser is a non-foaming gel cleanser and leaves my skin feeling clean but not stripped. I was a long-time Kielh’s facial cleanser user but I’ve been converted to this non-foaming cleanser. My favorite product by Jordan Samuel Skin is the Hydrate Facial Serum. We all know hyaluronic acid is the magic word in skincare right now, and this serum is formulated with hyaluronic acid as well as Vitamin C, cucumber, tamarind, and passion flower. I apply this to my skin morning and night and it immediately plumps and hydrates the skin. It’s incredibly lightweight and you see the results almost immediately. After the Hydrate Facial Serum, I alternate the Étoile Facial Oil in the morning and Étoile with Retinol Treatment Oil at night. Both oils are extremely lightweight and melt into the skin quickly and leave the skin feeling hydrated all day long. The Étoile Retinol Treatment is perfect for my acne prone skin as the retinol promotes cell turnover which evens out any skin discoloration while also unclogging pores. On top of the amazingness inside the bottles, the packaging on all of Jordan Samuel Skin feels elevated with its clean design. I love the glass bottles and eyedroppers which make product application feel luxurious. You can get all of these products online at www.jordansamuelskin.com.